The Whitetail Buck can become one of the most aggressive and dangerous animals during the annual rut or breeding season.These otherwise gentle animals take on a different character when it comes to territorial disputes during the fall and winter. This is always a dispute over a female or doe. The greater the shortage of females the more likely there will be a battle with other males over the affections of a female. Many buck deer are severely hurt or even killed during these battles. Antlers can be broken, eyes gouged out or fatal punctures occur on a regular basis. 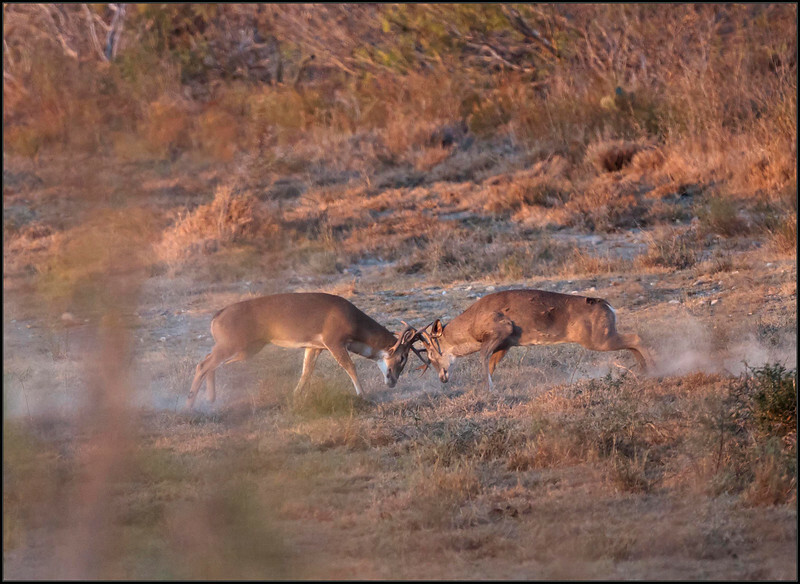 Battles between two buck deer are not usually seen by most hunters as the majority of them occur during night time hours. I was fortunate to film these two bucks, which appear to be about three years old, on a hunt in South Texas. The whole series lasted only about three minutes and both went away with very little damage. During the course of the battle, three other bucks showed up to witness the fight, but nobody wanted to take on a challenger.